Our year-round soccer league is all about giving children the opportunity to touch the soccer ball many times in a pressure-free game situation. Our Academy League coaches teach children the preliminaries of competitive soccer, sportsmanship, and team play. We offer children the experience of playing on a team, while focusing on player development and fun. All our practices and games lay the foundation for competitive soccer in a relaxed atmosphere. To make sure our players stay fit and active year-round, we provide indoor sessions during the harsh winter. During the spring and fall, we take advantage of our outdoor fields. Enroll now for the 8 week Spring 2018 Soccer Academy, which begins with a Meet & Greet (inside) on March 4th. Games begin March 30, Saturday games are played at practice location. $100 for ages 3-6 and $150 for ages 7-8 for 8 weeks of training and games, including an end of season Jamboree. New 3-6 year old players receive 2 uniform shirts. New 7-8 year olds receive two jerseys and will need to provide own dark shorts/socks for game days. 3/4 Pre-Mites practice 1x per week. Choose location & time. 5/6 Mini Mites practice 1x per week. Choose location & time. 7/8 Year Old Junior Mites practice 2x per week, Monday and Wednesday 5:30pm at Bearden Adaptive School. Enroll now for the Spring 2019 Soccer Academy, which begins Monday, March 11 and runs through May 11. To register, click Spring 2019 Soccer Academy. The fee is just $100 for ages 3-6 and $150 for ages 7-8 for eight weeks of training and games. WHEN: Meet and Greet week of March 4th. Training will start March 11th. Games will start March 30th. Ages 7-8 train twice per week: Mondays and Wednesdays 5:30pm – 6:30pm. All practices and games at Bearden Adaptive. *Some 9-year-olds may participate with 7- and 8-year-olds as a transition to competitive soccer. $150 for Junior Mites (age 7-8 to cover league entry fees) New Players receive two game jerseys. Players ages 3 to 6 years should bring a size 3 soccer ball for practices. Players ages 7-8 should bring a size 4 soccer ball for practices. Coach John Giles has 15 years coaching experience for ages 3-12 at all skill levels. 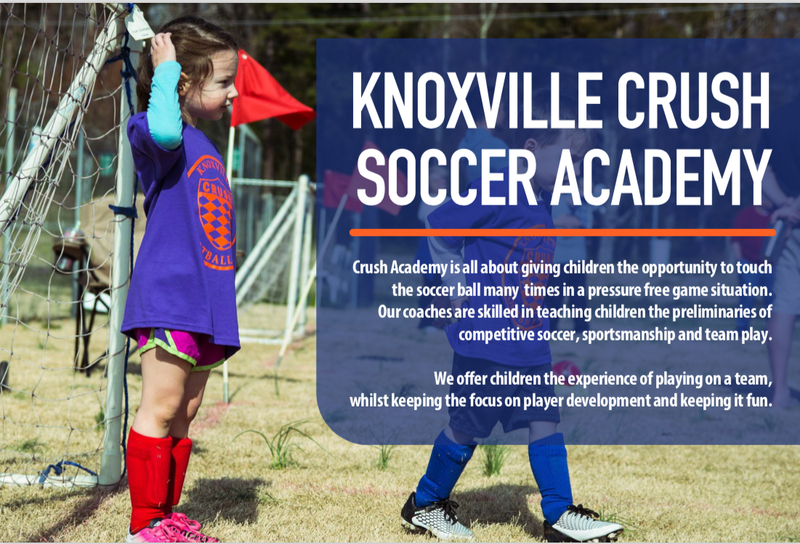 Together with Coach Casey Shanklin and Coach Haylie Smith, he has developed a comprehensive curriculum designed to move our Academy players from their starting point to the next level of profiency in soccer skills and game awareness.